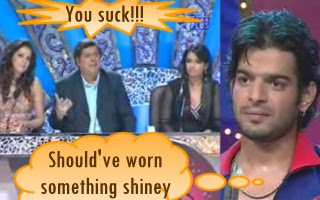 For some reason on Nach Baliye 3 last week, the judges were in a murderous mood. Maybe it was the fact that Madhuri Dixit wouldn't show up at all while promises were being made (enough to put anyone in a bad mood) or that a new jodi was announced and inserted mid-way in the show. Whatever the reason, they looked grumpy and came with their knives drawn. First, Karan and Amita danced their hearts out. In particular Karan really tried hard. But the judges seem to have decided en masse this wasn't good enough. So they dug into the hapless guy, none more sharply than Vaibhavi Merchant. Since Karan is always ready with a joke on the show, David Dhawan pulled the "you don't take this dance seriously" angle. Visions of Mika! Poor Karan swallowed hard and smiled like Asha Bhonsle would after running into Himesh Reshammiya. A little later, the new jodi took the stage. This I was curious to see because the reason given for the surprising insertion of the couple was that the show would pick up steam. It amused me to note that the jodi struggled to impress. One half - Barkha Bisht - seems to be a sharp dancer and appears to be an overachiever types - kind of like Mini Mathur (and we all know how that turned out on JDJ). The other half - Indraniel - unfortunately, comes from the Amitabh Bachchan Finishing School for Dancers. Their tepid performance was promptly mauled by all the judges with marks handed out so stingily I don't remember seeing anything so low. Both seem affable enough - but boy, it would be embarrassing if they were knocked out next week - which seems like a distinct possibility. 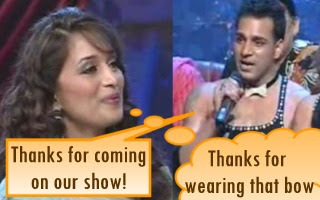 There was also a "Take your friend to work day" episode on Nach Baliye last week. This resulted in couples calling on their friends who then strode on the stage and did a vote appeal for their friends after saying something warm and fuzzy about them. Rakhi Sawant and Kashmera Shah decided they would bring each other as their friends. This entertained me: because both seem to be putting on an act (read Rakhi's comments on Kashmera in Sakshi's interview with her on the sets of NB if you don't believe me). How did the star guests fare on the show? It was a completely disastrous week and I am really starting to get peeved off with the stupid teasers that turn out to be damp squibs. The Madhuri appearance however hilarious and contrived still was not enough to bolster what was a seriously hackneyed evening. Out of so many yashraj films the contestants seemed stuck on Bunty and Bubli and Dhoom 2. "Amitabh Bachchan Finishing School for Dancers" - Totally ROFL!!! Is it just me or are others getting irritated with celebs on these shows trying to promote their movies? Did anyone see SRGMP lil'? Mauli and Aneek were visiting and no prizes for guessing what song Mauli sang. I've spent days trying to master the 'Mera Piya ghar aaya' step in school and finally gave up b'coz I could never get that expression.sigh. Boy, she gets excited easily, doesn't she?